Wireworld Chroma (Miami edition) review | What Hi-Fi? Find £60, and you can step up from your entry-level HDMi to the Wireworld Chroma Miami Edition (called Miami because it was here the designer was on holiday when it was being finished). 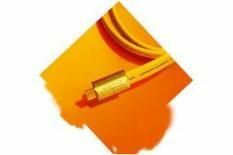 Resplendent in lurid yellow, it's a highly competent cable in every regard, as we've come to expect from Wireworld in recent months: pictures are crisp and composed with the Chroma Miami presenting images with bags of life and sparkle. The only issue surrounds its sonic presentation, which lacks some of the low-frequency heft of some close rivals. That, and the price, is enough to lose it a star.